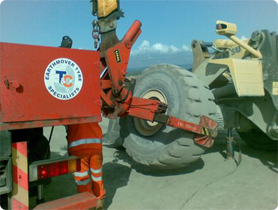 T&C Site Services Ltd is the largest independent earthmover and OTR tyre specialist and service provider in the United Kingdom. Nationwide coverage and 24 hour availability ensure that customers are offered the most cost effective earthmover tyre breakdown service available. T&C sets itself apart from competitors with its purpose built fleet of vehicles ranging from 3.5 tonne to 32 tonne gross weight that will accommodate all service requirements. Specialist equipment and training enable us to cope with the most demanding of tasks. Large business capability with small business values! T&C has grown from a small, family run business – but has not lost the local touch – every customer is important to us and we can operate nationwide! We emphasise high quality service, value for money and safety for both our customer and our own operations.